Action adventure is a thriller, mystery, and suspense genre wherein fast-paced action is the primary component, outshining even characters and setting. This genre also usually includes a secondary element such as a murder investigation or a quest, but the main focus is always on fast-forward action. Subgenres of action adventure include crime action & adventure, fantasy, men’s adventure, mystery, organized crime thrillers, romantic suspense, science fiction, sea adventures, suspense, terrorism, thriller, war & military, and women’s adventures. Because children mature so quickly and each age group requires its own criteria of stimuli, the children’s category is divided by ages 0-2 (children’s picture books), ages 3-5 (children’s read to me), ages 6-8 (children’s first readers), and ages 9-12 (middle grade). While the first three children’s books are judged on their use of mystery, thriller, and suspense to tell the story, there is no romance in these books and the puzzles or crimes are not graphic in any way. These books are designed to pique a child’s curiosity for one’s world and bestow the love of reader. All children’s stories will be entered under the Fiction category. Fantasy is a thriller, mystery, and suspense genre set in a fictional universe; if on earth, it is not earth or history as we know it. There are usually supernatural elements. Mystical and magical creatures are common in fantasy novels. This genre contains the subgenres of alternative history, Arthurian fantasy, comic fantasy, dark fantasy, epic fantasy, fairy tales, fantasy action adventure, heroic fantasy, high fantasy, historical, magic realism, modern fantasy, mystery, mystery fantasy, mythological fantasy, romance, suspense, sword & sorcery, thriller. Horror is a thriller, mystery, and suspense designed to frighten, scare, disgust, or startle the readers. It should produce emotional psychological or physical fear in the reader. Subgenres of the horror genre include ghosts, gothic horror, murder, mythology, occult, psychological thrillers, vampires, werewolves, witchcraft. Humor is a thriller, mystery, and suspense genre designed to be funny, comical, or amusing. Subgenres of the humor genre include action & adventure, anecdotal, black, blue, caper, character, cringe, dark, heritage, historical, mockumentary, observational, physical, satire, spoof, surreal, and topical comedies. Graphic novels are much more than superheroes and, while we like superheroes, we are looking for all graphic novels using the elements of mystery, thriller, and suspense to tell their stories. The cozy mystery genre is a suspense story in which a protagonist solves a crime or puzzle, though very little graphic or gory detail of the crime is included. Subgenres of the cozy mystery include amateur sleuths, standard British detectives, and women sleuths in a cozy non-professional context. The procedural mystery genre is a thriller and suspense story in which a professional protagonist (detective, journalist, attorney, physician) solves a crime, usually gruesome and with graphic detail. Subgenres of the procedural mystery include hard-boiled, historical, international, police procedural, private investigator. Poetry can be in any style, but for our purposes, we are looking for poetry that evokes a feeling or tells a story. Narrative poetry subgenres include poetry that incorporates elements of action adventure, fantasy, horror, humor, mystery, romantic suspense, science fiction, and thriller. In the case of several authors, the physical award will be given to the editor. The romantic suspense genre is a thriller, mystery, or suspense novel that is propelled equally and synchronously by the threat of jeopardy and the promise of romance. The science fiction genre is a thriller, mystery, or suspense category that foretells science and technology in the future (or forgotten and lost past) based upon what actually could happen should mankind have the technology. Includes any collection of short stories by one author or several in the categories of action adventure, fantasy, horror, humor, cozy and procedural mysteries, romantic suspense, science fiction, and thriller. In the case of several authors, the physical award will be given to the editor. The thriller genre is a mystery or suspense category that covers a broad spectrum, probably overlapping numerous genres, but defined mainly by the moods it produces using techniques of anticipation and surprise. The thriller should keep the reader unbalanced in terms of what might happen next. Normally a thriller centers on the pursuit of (or prevention of) a single goal. The young adult genre we are interested in involves mystery, thriller and suspense elements. The target for this award is a young adult; however, if you have an entry that would appeal to adults, as well (the Harry Potter franchise, for example), you can also choose to enter it in that genre category rather than generically here. Includes true crime and applicable medical, legal, and scientific subjects relating to solving crimes. This category also includes investigators and perpetrators, criminals and those who catch them, along with law enforcement and military issues. Includes biographies and memoirs of writers, filmmakers, and other storytellers. We are looking at essays relative to writers, not just any subject. These essays can be serious to humorous and include works of only one author or many. In the case of several authors, the physical award will be given to the editor. Includes topics on advertising, blogs, book launching, branding, search engine optimization, social media, touring, web marketing, and websites. This category includes writing how-to books in any writing or publishing genre. From initial idea, to rewrites, to publication, this category covers the entire business and craft of writing. Includes any guide or reference that would be of practical use to a writer including how-to-write books, how to get published, how to self-publish, grammar guides, and writing techniques related to characters, description, dialogue, location, plotting, scenes, theme, voice, editing, rewriting, and research techniques. Writing is solitary and lonely; publishing is filled with rejection. This category includes any book that can be used to help writers persevere over those humps and keep going. Physical award in each category, bragging rights, increased exposure, and $250 for both best overall work (fiction or nonfiction), payable to the winner. Announcements include finalists, as well as winners. 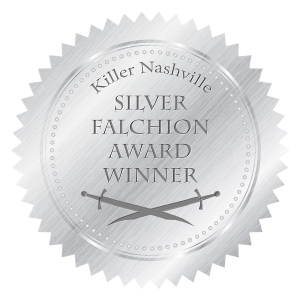 Please note: In order for a category to be awarded, entries in the Killer Nashville Silver Falchion Awards have to be worthy of that honor; otherwise, no award will be given in that category. We believe all engaging stories have three elements: mystery, thriller, and suspense. Since 2008, the Killer Nashville Silver Falchion Awards have recognized the best stories from the previous year told through various media utilizing the elements of mystery, thriller, and/or suspense. Judges are professional writers, book reviewers, librarians, academics, and—in specialized cases—specific industry peers. Focus is on quality, not popularity. The Killer Nashville Silver Falchion Award began as a way to recognize Killer Nashville attendees and has since grown worldwide into an industry-coveted prize. The Killer Nashville Silver Falchion Award continues to have NO ENTRY FEE for conference attendees. The charge for non-attendee or additional attendee submissions is $79 per entry to cover our expenses. Eligible works must have been first published in English between January 1, 2018 and January 1, 2019. To be eligible for the Silver Falchion Award, works must be published the year previous the competition and must be readily available to a North-American audience (either in print or digital format). We make no distinction between self-published, indie-published, and traditionally-published works; all are eligible to be entered into the competition so long as they adhere to the guidelines above. Firm deadline for submission June 1, 2019. Killer Nashville will contact publishers, but fundamentally it is the task of each author to ensure his or her work is submitted either by his/her self or through his/her publisher. Entries received after June 1, 2019 are ineligible. Finalists will be announced July 25, 2019. Killer Nashville will contact all finalists using submitted information alerting them to the honor. If contact info changes, please contact Killer Nashville so we may get in touch. Finalists will be honored and winners will be announced at the Killer Nashville Awards Dinner on August 24, 2019. Please note: You will find all children’s books, graphic novels, comics, screenplays, stage plays, videogames, and poetry listed under ‘fiction’.